We did go out for Valentine’s day, but the day after my hubby had some major dental work and I made something that was complicated but not too chewy, lots of work but a labor of love…note the heart on the pie. Chicken pot pie is one of those highly chemical looking mass produced foods in the States that come under many varieties and labels, I haven’t checked the labels lately but imagine most have fats and MSG. Making your own from scratch can be a bit of kitchen labor but the outcome is a big pie that you can make uniquely your own! In a saucepan put raw chicken cubes, celery and carrots, cover with water, not excessively and cook until chicken is done and veggies are soft but not mushy, 10-15 minutes. Drain liquid and save. You can use the broth from this for your bechamel below. Brown onions in butter until translucent. Add flour, salt and pepper to your taste (I’m generous with pepper) with wire whisk, pour in liquids and simmer until it thickens, whisking. Pour this bechamel over the chicken and veggie mix, add fresh chopped parsley and frozen peas. Pour mixture into pre-prepared pie crust and cover top with top sheet of crust using a fork all over the top to pierce to let steam escape. 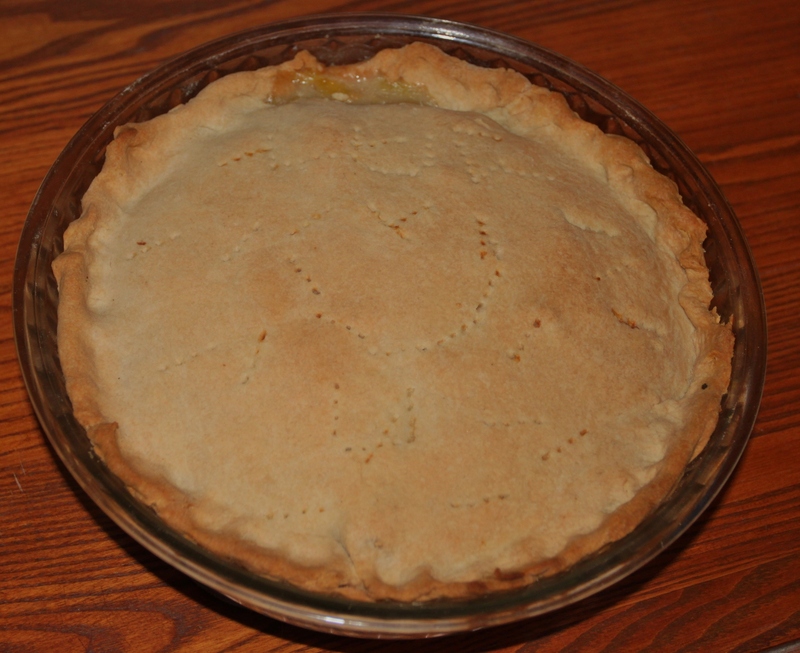 Bake 15 minutes at 425 then reduce oven to 350 F or 185 C. Pie is done when crust is golden brown. I was watching a local travel show and the two women featuring an Alpine ski weekend in Solden, Austria dined at a nearby restaurant with a locally acclaimed chef who stated, “Because we are close to the Italian border, our cuisine here has been influences by Italian flavors.” Watching the ingredients and a few brief shots of the chef preparing this dish I created my own. Fry minced garlic in olive olive, add herbs, add tomato paste and blend. Pour in 2/3 cup of water, bring to a simmer. When sauce is prepared add half capers. After sauces are prepared begin boiling linguini to be served al dente. While that is about 1/3 ready, melt two tablespoons of butter in a pan with olive oil. Add the two filets and pan fry until filets are browned on both sides and fish flesh white and tenderly flaky, not dry. When close to done add a few oregano leaves to season. When linguini is al dente drain and reserve a little bit of pasta water, about 1/2 cup. back in the pan you prepared it in return linguini and add half or more of the pesto dpepending on how much pasta you made until pasta is covered and green. If it seems dry add some of the pasta water and combine. Place on serving platter. 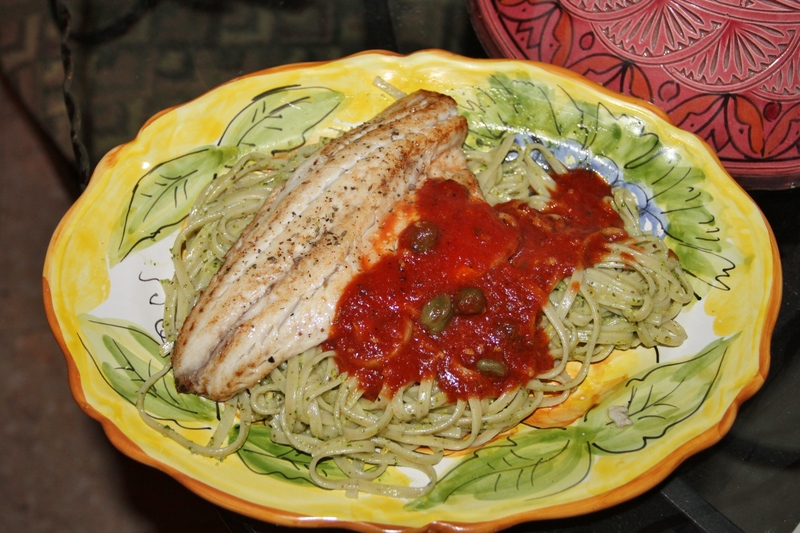 Place filets over the bed of pasta and pour tomato-caper sauce over and decorate with other tbsp of capers and a few of the fresh oregano leaves.